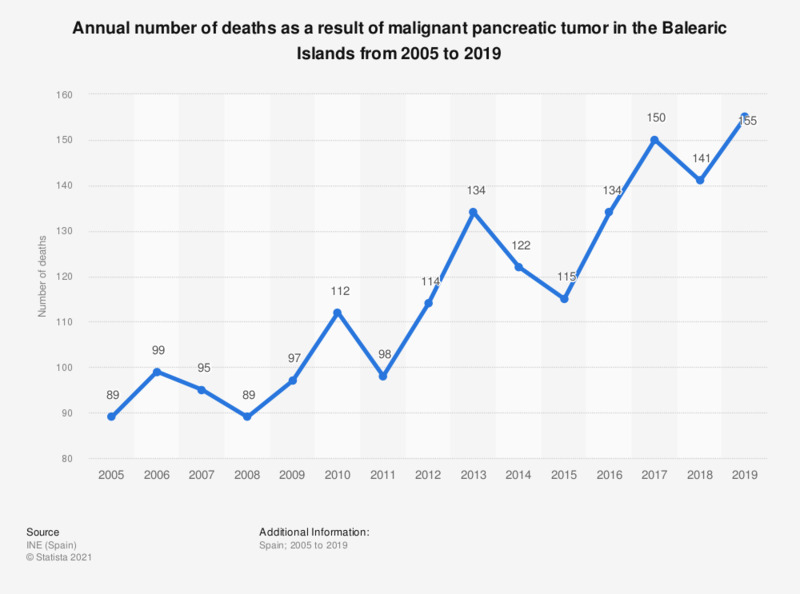 This statistic presents the annual number of deaths due to malignant pancreatic tumor in the Balearic Islands from 2005 to 2017. In 2017, a total of 150 deaths were registered due to this type of cancer in that autonomous community. The number of deaths from pancreatic cancer in Spain amounted to 6,9 thousand deaths in 2017, which represents a considerable increase compared to previous years. *Pancreatic cancer is one of the most aggressive forms of cancer since it is usually diagnosed late due to the absence of specific symptoms. The main risk factors include tobacco and alcohol consumption, genetic predisposition, diet and obesity, the presence of diseases such as diabetes mellitus or chronic pancreatitis, and age and gender. This type of cancer manifests more frequently in men after 70 years of age.